As the proud father of an Irish dancer, St. Patrick’s Day has always been a special holiday for me and my family. But even if you’re not Irish (even for a day), there are still plenty of green reasons to celebrate this spring, in addition to the Irish dancing. Just last week, Evanston became the first city to achieve recertification as a 4-STAR Community through the updated STAR Community Rating System, the nation’s leading framework measuring local sustainability. Evanston was also recently named a “Top 100 Best Place to Live” in the nation–and the best in Illinois–by Livability.com, thanks in large part to our sustainability efforts. Our environmental stewardship will continue next Saturday, March 24, as we turn off our lights for one hour, from 8:30 p.m. to 9:30 p.m., in celebration of another green holiday, Earth Hour. While turning off the lights reminds us to conserve energy, budding leaves remind us that yard waste season is just around the corner. New this year, food waste will be able to "ride along" with grass clippings and leaves in our yard waste carts, helping conserve vanishing landfill space. That's a reason to celebrate. All you need to participate is a reusable yard waste container, which are available for purchase on the City’s website. Weekly collections begin on April 2. Stay tuned for more information. On April 21, we'll celebrate our city's beautiful trees and our environment at the annual Earth Day/Arbor Day "Clean Up, Evanston!" event. Visit Volunteer Evanston later this month to sign up for opportunities to tidy up parks and green spaces, which are sure to see a lot more action as spring arrives. So whether you're celebrating your Irish heritage this Saturday or cleaning up a City park on Earth Day, there are plenty of green reasons to smile this spring. Longer days and warmer temperatures mean enjoying all of the great things our city has to offer, from tree-lined streets, to beautiful parks, to, yes, even composting. In Evanston, being "green" doesn't end on St. Patrick's Day–it's only the beginning. Please join me for a Town Hall Meeting on Tuesday, April 3, 7 p.m., at the Levy Senior Center to discuss community issues. I look forward to hearing your input. 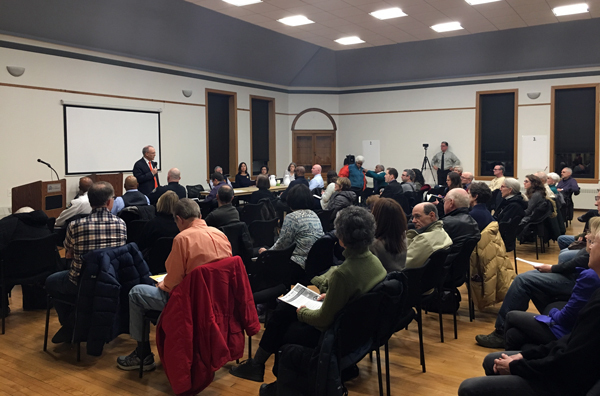 Thank you to the 100+ community members who attended our Community Forum on Gun Violence on February 22, especially our panelists, which included Chaplain David Jones; Denyse Stoneback, People for a Safer Society; Dr. Marjorie Fujara, Cook County Health & Hospitals System; and Dr. Traci Kurtzer, Moms Demand Action. Thanks also to Dan Coyne, who live-streamed the forum on Facebook. As Evanston Chaplain David Jones says, we need to put a comma after "thoughts and prayers," and go forward and be leaders establishing sensible gun safety laws in this country. That was made even more clear late Wednesday afternoon, on the same day of the national school walkout, as Evanston had its own active threat scare. You can read more of my thoughts on Facebook. On March 9, I had the honor of delivering my first State of the City Address, hosted by the Evanston Chamber of Commerce, at the Holiday Inn Chicago North-Evanston. 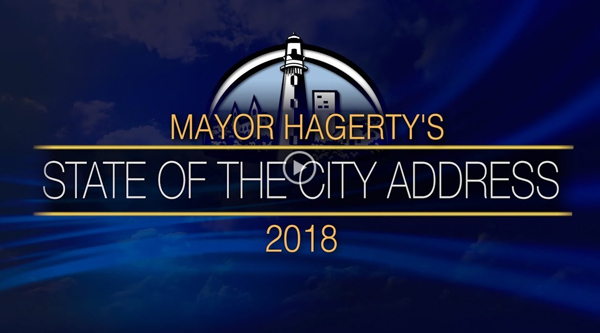 A schedule of when the Address will be broadcast on Channel 16 is available at cityofevanston.org/tv. Video of the event, my full remarks, social media coverage, and the City's 2017 Annual Report can be viewed online. 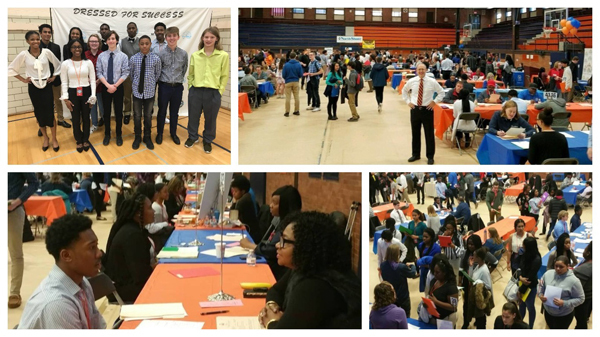 More than 40 employers participated in the 26th annual Mayor's Summer Youth Employment Program (MSYEP) Job Fair on March 3 at Evanston Township High School, offering more than 1,000 jobs. Thank you to the many employers, volunteers and staff who made the event such a success. I look forward to a great summer! At the State of the City Address on March 9, I was proud to announce the launch of Elevate Evanston, a citywide initiative uniting our community’s efforts to connect individuals with employment opportunities, job training, and career education. Explore the many resources our community offers at the new website, elevateevanston.org. Target Is Now Open In Sherman Plaza! There's a new place to shop in downtown Evanston! 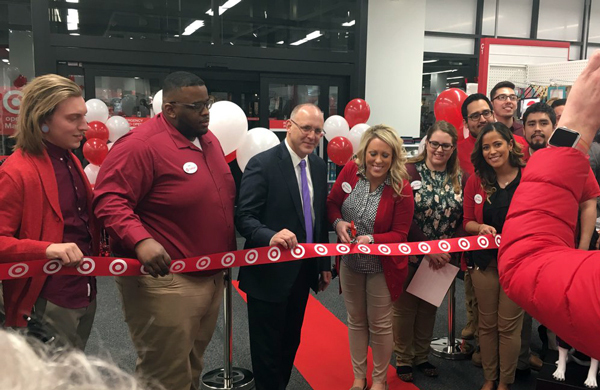 Target celebrated the grand opening of its new, small-format store in Sherman Plaza this past Sunday. They also hired students from ETHS and Northwestern. Thank you, Target, for elevating Evanston. Happy 7th Anniversary to Evanston 311! 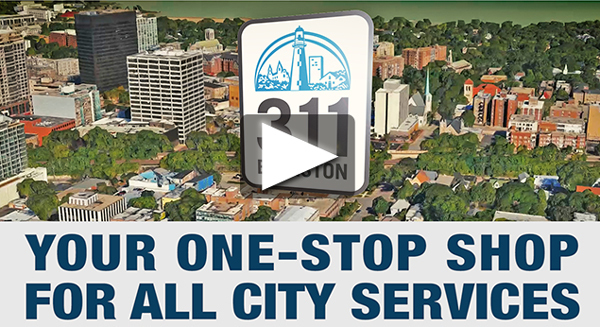 Evanston 311 is your key to City information and services, and they celebrated their 7th anniversary on March 1! Be sure to call or text 847-448-4311 to ask a question or submit a request for City services. Did You See "I.D." at ETHS? In February, I was thrilled to see the original Evanston production, "I.D.," return to the stage. The play, which was performed at ETHS, examined race and identity in our city and featured a diverse cast of very talented youth. 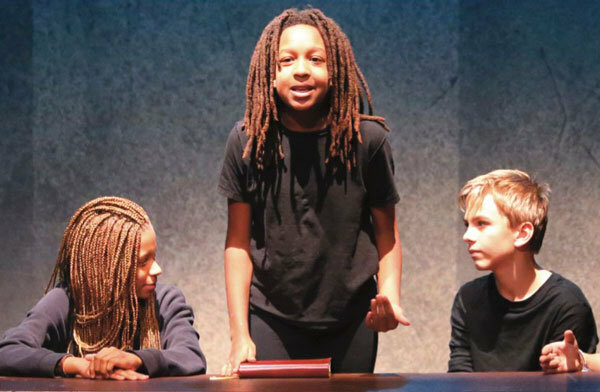 If you missed "I.D.," you can read a recap of the production in The Daily Northwestern. What Else Is Happening In Evanston? 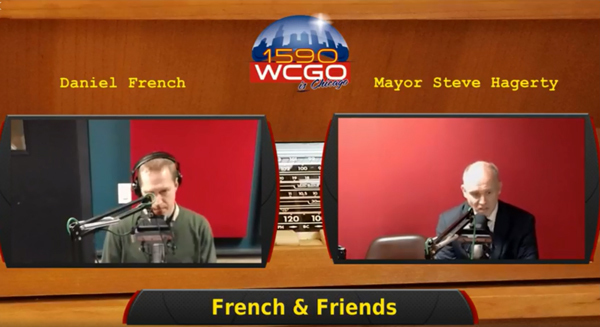 I was pleased to join "French and Friends" on 1590 WCGO last month to discuss happenings in Evanston, including our Public Works Agency's snow clean-up efforts this winter, summer concerts at Canal Shores, Evanston Police Department body cameras, and more. You can watch the complete interview on Facebook. 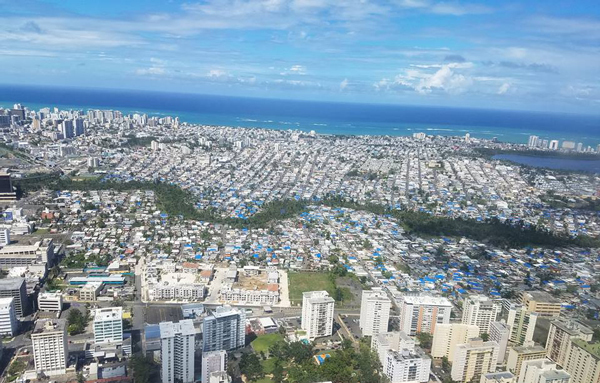 In February, I made a 24-hour visit to Puerto Rico to assist with disaster recovery as part of a Mayor exchange program. Check out my Facebook page to see photos from the trip, as well as my thoughts from the visit.